TORONTO, March 10, 2016. 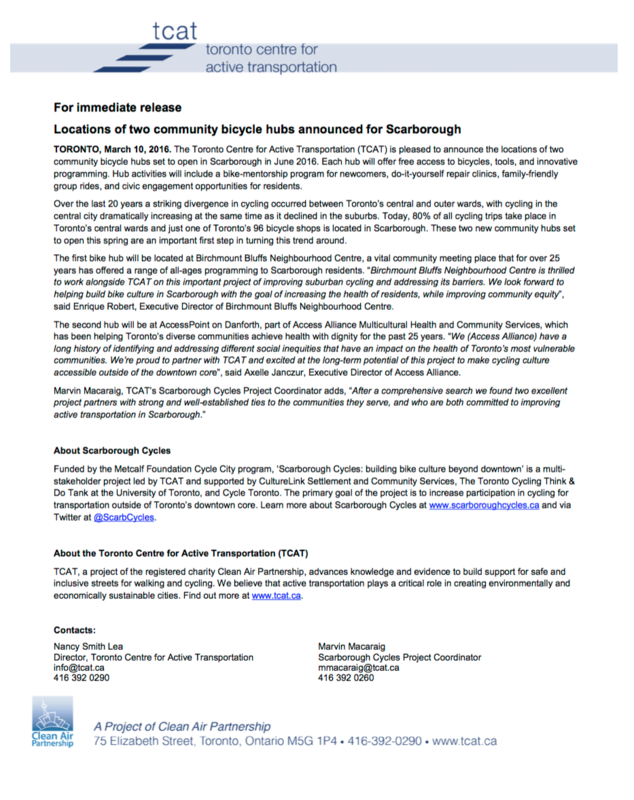 The Toronto Centre for Active Transportation (TCAT) is pleased to announce the locations of two community bicycle hubs set to open in Scarborough in June 2016. Each hub will offer free access to bicycles, tools, and innovative programming. Hub activities will include a bike-mentorship program for newcomers, do-it-yourself repair clinics, family-friendly group rides, and civic engagement opportunities for residents. Over the last 20 years a striking divergence in cycling occurred between Toronto’s central and outer wards, with cycling in the central city dramatically increasing at the same time as it declined in the suburbs. Today, 80% of all cycling trips take place in Toronto’s central wards and just one of Toronto’s 96 bicycle shops is located in Scarborough. These two new community hubs set to open this spring are an important first step in turning this trend around. The first bike hub will be located at Birchmount Bluffs Neighbourhood Centre, a vital community meeting place that for over 25 years has offered a range of all-ages programming to Scarborough residents. “Birchmount Bluffs Neighbourhood Centre is thrilled to work alongside TCAT on this important project of improving suburban cycling and addressing its barriers. We look forward to helping build bike culture in Scarborough with the goal of increasing the health of residents, while improving community equity”, said Enrique Robert, Executive Director of­­­ Birchmount Bluffs Neighbourhood Centre. The second hub will be at AccessPoint on Danforth, part of Access Alliance Multicultural Health and Community Services, which has been helping Toronto’s diverse communities achieve health with dignity for the past 25 years. “We (Access Alliance) have a long history of identifying and addressing different social inequities that have an impact on the health of Toronto’s most vulnerable communities. We’re proud to partner with TCAT and excited at the long-term potential of this project to make cycling culture accessible outside of the downtown core”, said Axelle Janczur, Executive Director of Access Alliance. Funded by the Metcalf Foundation Cycle City program, ‘Scarborough Cycles: building bike culture beyond downtown’ is a multi-stakeholder project led by TCAT and supported by CultureLink Settlement and Community Services, The Toronto Cycling Think & Do Tank at the University of Toronto, and Cycle Toronto. The primary goal of the project is to increase participation in cycling for transportation outside of Toronto’s downtown core. Learn more about Scarborough Cycles at www.scarboroughcycles.ca and via Twitter at @ScarbCycles. TCAT, a project of the registered charity Clean Air Partnership, advances knowledge and evidence to build support for safe and inclusive streets for walking and cycling. We believe that active transportation plays a critical role in creating environmentally and economically sustainable cities. Find out more at www.tcat.ca. A PDF version of the press release is available here.